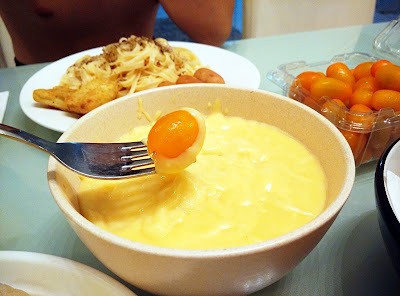 Do note this is not the original Swiss cheese fondue due to non-alcoholic. I'm also using whatever type of cheese convenient to me. Traditionally cheese is served in a fondue pot with lit candle beneath the bowl to maintain texture but I don't have one. 1. Mix flour with shredded cheese. 2. Pour chicken broth into pot and simmer for 2 minutes. 3. Pour all cheese into pot and stir till melted. 4. Season with ground nutmeg and salt. 5. Voila! It's done! You can serve with anything you like. 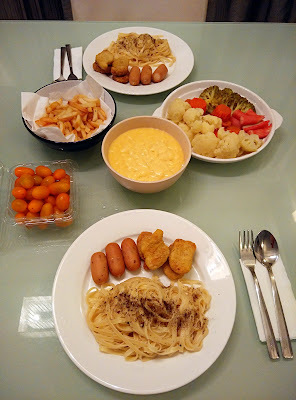 I prepared broccoli, cauliflower, carrots, crabstick, fries, nuggets, sausages, cherry tomatoes and leftover cheese poured on pasta. And I hate roti so no bread here but traditionally served with French bread lah.